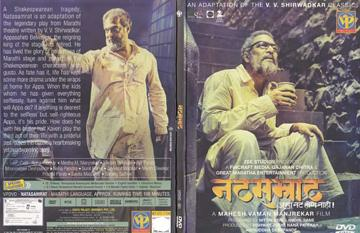 Natsamrāt is an Indian 2016 Marathi-language drama film featuring Nana Patekar in the leading role. It is directed by Mahesh Manjrekar. The film is a tragedy about a Shakespearian veteran theatre actor named Ganpat Ramchandra Belwalkar/Appa (Alias) (Nana Patekar) who has been an acclaimed theater actor during his day, garnering fame and fortune acting in plays based on various works, especially William Shakespeare's and also win the highest fame with title (An Award) of NAT-SAMRĀT (emperor of acting or of theatre). One fine day he reads that his favorite theatre has been burned down in a fire. He immediately goes there and is completely shattered to see the theatre reduced to a rubble. Where Siddharth also came by following him. Here he starts reliving his old memories and also accept Siddharth's consultings that they are real when Siddharth reveals that he knew all about his past and him. Also his family and Raja come there to find him. They request him to come home him and to live with them but he refuses it. The film ends with a magnificent as well as a tragic end where Appa in a delusional state shuffles between reality and great personalities which he once played as an actor on that very stage. He gives his last performance on that theatre's stage for Siddharth. Then says to Siddharth that, "That's How Acting is!" To fulfill his willing. Unexpectedly he squeals by placing a hand on his thorax and falling down. All are run to catch him immediately but then they found that He is departed. This item in Regional Movies category was first added to our catalog on 04-17-2016. Buy Natasamrat - 2016 Marathi Movie DVD, sold & shipped by Movie Time Video where you can shop online for Pooja Mandir, Bajot, Gifts, Hindi Movie DVD / CD, Music Video. This Regional Movies collection has been tagged as Marthi DVD, inspiring Marathi Blu Ray, maharashtrian film, 2016 Cinema, bollywood film.